Hi All, and welcome to another two week challenge at Smudgy Antics. For the next two weeks we want to see lots and lots of texture on your projects. You can make anything you want, but it must contain a stamped image (rubber or digi) somewhere on your project. 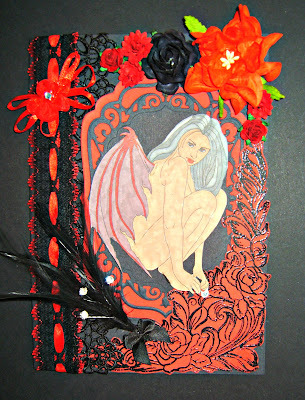 The image is a digi stamp named Succubus #5 and is available from Smeared Ink. The image is coloured with Promarkers and for texture I have used heat embossing, die cuts, lace, ribbon and embellishments. You have so much on there!! Yet it is laid out soo well, kudos!! Wonderful texture. I love red & black and the embossed roses are fabulous. Thanks for joining us this week for Extra Texture. Beautiful creation. Love the strong colors. Thanks for joining our "Add Extra Texture" challenge this week at Tammy's Scrapin Corner. Great design. You surely added lots of texture. Thanks for joining us at Tammy's Scrapin Corner for this challenge. Thankf for joining us at Kreativeinkauf-Challengeblog. Cool card! Love the heat embossing. Thanks for joining us at Tuesday Throwdown! locomotive improvement enables a playacting much foster.